A wit once proclaimed that if Switzerland were ironed, it would be quite a large country. Yet in spite of being relatively small (16,000 square miles), Switzerland is so famous for its mountains, predominantly in the southern half of the country, that there are “Little Switzerlands” all over the world: from North Carolina and the Drakensbergs of South Africa to Luxembourg and even Folkestone, Kent! The iconic Matterhorn too has “lookalikes” in many mountain ranges. Although Switzerland has 26 cantons (or districts) the most mountainous is Valais, including many of the most famous Swiss ski resorts. Berne and Graubünden also have some of the highest peaks in the Swiss Alps. Indeed, British mountaineers and skiers have long had a special relationship with Switzerland. The British climber Edward Whymper was the first to climb Zermatt’s Matterhorn. Wengen and Mürren all played important roles in early British ski racing. The first world ski championships were held in Mürren in 1931 and St. Moritz in 1934. St Moritz also hosted the Winter Olympics in 1934 (before alpine events had been included) and again in 1948. About 100 of Switzerland's mountain peaks are close to or higher than 4,000 metres (13,000 ft) and between them Zermatt and Saas-Fee are surrounded by more than thirty of them! Flying into either Geneva or Zurich opens up a railway network to a galaxy of Swiss resorts - the efficiency and comfort of the Swiss railway system is second to none. Along with Crans-Montana, Verbier (with its ‘4 Vallées’), St Moritz (home of the bobsleigh), Davos and Klosters, and the Jungfrau resorts of Grindelwald, Wengen and Mürren (famous for the magnificent Eiger) these resorts are all well-known to British visitors. Valais alone is home to 41 ski resorts, including Zermatt, Verbier, Saas-Fee (with the highest mountain entirely in Switzerland, the Dom), Crans-Montana, and a handful of resorts in the vast Portes du Soleil region. Four languages are spoken: Swiss German (the main language) plus French (the country’s second most widely spoken language) followed by Italian and a much smaller pocket of Romansch speakers. Most inhabitants speak at least one other Swiss language apart from their own, and many also speak English. This diverse cultural background influences Swiss cuisine – there is even a joke that when you travel from French-speaking Swiss ski resorts to German-speaking areas, you will cross an imaginary “rösti” (hash browns) border. Switzerland is famous for its dairy products and dishes such as fondue and raclette are very much cheese based: Gruyère and Emmental are classic Swiss products. So too are Pirmin Zurbriggen and Didier Cuche - among the most successful Swiss skiers! The canton of Graubünden is home to the exclusive St. Moritz, where the first Brits visited Switzerland to ski in 1864. This was part of a wager with the manager of what is now Hotel Kulm, who offered them a free stay if they did not enjoy the winter in St. Moritz, as much as the summer! Now, St. Moritz is one of Switzerland’s most famous destinations. Graubünden is a top ski destination boasting 3 of Switzerland’s top ski areas: Davos, Klosters, St. Moritz and the newly-linked Arosa-Lenzerheide, which offer a combined total of 850km of pistes. 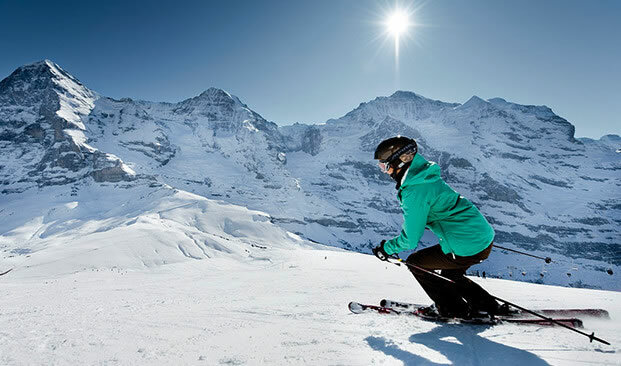 From Grindelwald's perfect beginners' nursery slopes at Bodmi and long scenic, tree-lined runs on 'First', to Wengen's satisfying red runs at Kleine Scheidegg, to Mürren's more challenging mogul fields up at Schilthorn, the Jungfrau area really does have something for everyone - all with the Eiger, Mönch and Jungfrau trio as a spectacular backdrop. In a sheltered mountain bowl surrounded by breathtaking peaks, Arosa is a long-established ski resort with chocolate box scenery and a fantastic ski area suitable for all abilities. In the stunning canton of Graubünden, it enjoys a beautiful setting high up at the end of the valley and has an excellent snow and sunshine record. Davos, a bustling town just up and over from the more genteel Klosters, is set in a spectacular valley, with great views all around. Davos, most famous these days for hosting the annual World Economic Forum, is a friendly town – the highest in Europe - offering 300km of world-class skiing. Klosters shares its neighbour Davos' 300km of great skiing and the full ski area is available on one pass. Few resorts in the Alps boast such a dramatic panorama. Almost everywhere you look, the horizon seems to be pierced by jagged, snow-covered “horns” – (Schwarzhorn, Bocktenhorn, Weisshorn, Scalettahorn and Tinzenhorn – the “Matterhorn” of Davos) most of them well over 3,000 metres. 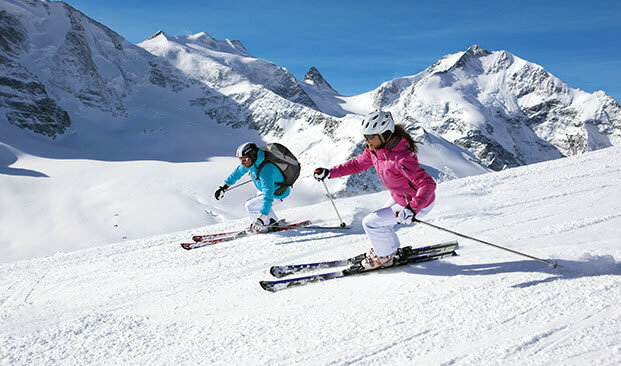 St Moritz, with around 354 km of pistes, is one of the most famous ski resorts in the world. Thanks to its idyllic location, on a sunny terrace in the beautiful Engadin valley overlooking a big frozen lake, St Moritz hosts all kinds of other winter sports - there’s skating, curling, horse-racing, polo, cricket, golf and even ski-joring : being towed on skis behind a horse. This traditional mountain village is set amidst spectacular scenery at the foot of the towering north face of the Eiger. Easy access via mountain train, gondola and cable-car to the ‘Jungfrau’ ski region including the pistes linking Kleine Scheidegg and Männlichen. The idyllic village of Wengen lies high up on a sunny, sheltered terrace with spectacular views, dominated by that magnificent trio of peaks – the Eiger (Ogre), Mönch (Monk) and Jungfrau (Maiden) – which provide a magnificent backdrop to Mürren and Wengen, and in part to Grindelwald, all of which enjoy genuinely superb in-your-face scenery. Mürren, perched high above the Lauterbrunnen Valley, is one of Europe’s most historic ski areas: a “cradle” of Alpine skiing! The peaceful traffic-free village is set dramatically on a terrace on the other side of the valley from Wengen, You can only reach it by cable car. Even without its iconic Matterhorn, Zermatt would surely be one of the world’s top ski resorts. It boasts a huge ski area at high-altitude, and the breathtaking views of Europe’s most famous peak add an unbeatable and unique crowning glory.